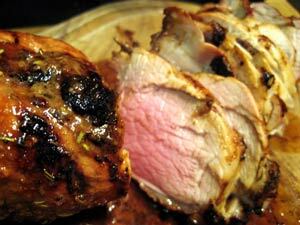 Grilled Pork Tenderloin, with an Oriental twist, easy dinner recipes. This is a 'liquid' marinade that gets nicely into the pork. Continue basting as it cooks, but remember to stop about 10 minutes before you take the pork off the grill, and give the pork one last turn, so any 'raw' marinade is cooked before removing the pork. Do not use any leftover sauce without cooking it first. Pink is best for pork. Put all ingredients except pork into a bowl and mix well using a whisk. Pour over pork and let marinate for 15 minutes. When ready, cook pork on barbecue for 25 - 30 minutes, depending on thickness. 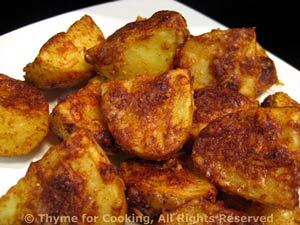 Turn occasionally to brown on all sides and baste frequently with marinade. Quit basting after 15 minutes. Pork is done at 145 F (62C). It will be slightly pink in the center which is perfect. If you don't have a thermometer (instant or remote read) check it after 20 minutes by slicing into middle for a peak. When done let it rest for 3 - 4 minutes, then slice at an angle, into 1" (2.5cm) thick slices and serve. Note: Could also be roasted about the same amount of time, turning and basting, 400F (200C). Sliced zucchini, sautéed in garlic oil and finished with a bit of good Balsamic vinegar and some fresh herbs; simply delicious! If you like, rather than discarding the garlic, you could mince it and sprinkle on the finished veg. Add whole, peeled garlic cloves and cook until golden. 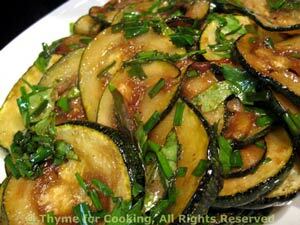 Add zucchini slices and sauté over medium heat until tender, about 15 minutes, stirring occasionally. Add the vinegar and the herbs, and sauté 1 minute longer.